Great for in-store product displays, cakes, tradeshows, museums, specials, etc. 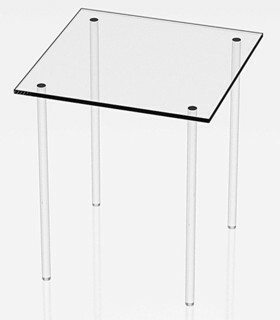 Our Clear Acrylic Square Table Risers are High Quality, Durable Pedestals to Make Your Products STAND OUT! The Clear Acrylic Square Table Riser Offers a Classier Appearance Than The Traditional Flat Riser Allowing For More Visual Appeal and Ability to Stack to Create Dazzling Displays.